how to automatically track File Downloads, Email clicks and External links across a website of any size with very little work from you or your developer and that too FREE of cost. Why you should automate Event Tracking? Now if my website has say 5000 pages and some 400 pages contain the links to download my ‘SEO beginners guide’ then imagine how much work I need to do to track all these downloads. I will have to manually find all the web pages which contain the download links and then manually place the tracking code on each and every link. Now imagine I also need to track all the external links on my website and determine how much traffic my website is sending out to other websites (esp. if I am an affiliate). Now how you can do all these tasks without spending weeks/months in putting event tracking code on each and every external link? The answer is event tracking automation. I recently came across this awesome tool which I have been using for a while now. Through this tool you can track email clicks, external links and file downloads across a website of any size in few minutes. All you have to do is put a little tracking code in the head section of each web page on your site. The ‘outbound’ event category tracks all the external links on my website and the ‘download’ event category tracks all the downloads occurred on my website. As you can see from the report above, 109 downloads occurred on my website and all the external links on the site were clicked a total of 13,873 times in the last one month. My website doesn’t have any email links. Otherwise you would have seen a separate event category for that in my report. From Fig.2 you can see the list of top 10 websites which have got traffic from my site eventeducation.com in the last one month. Such type of tracking is known as Exit tracking or outbound links tracking and it can be very useful esp. if you are an affiliate. So what you need to do, to use this tool? Step-1: Sign up for the free Lite version. Hey I am no way associated with the business behind this tool. I just found it and thought of sharing it with you. Step-2: Copy paste the tracking code provided by the tool in the head section of all the pages on your website. 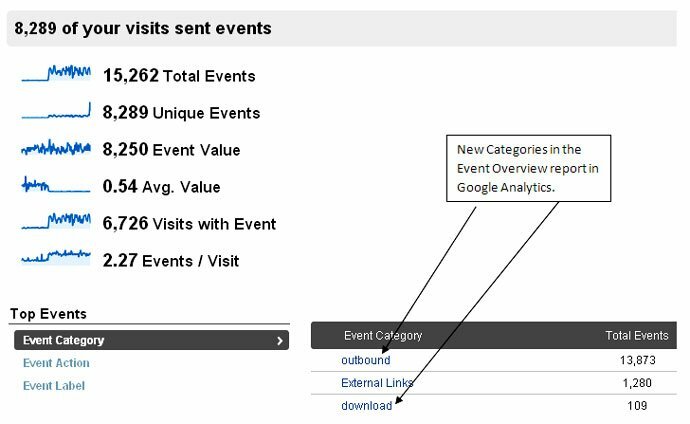 Wait for couple of hours and then check your event tracking report in Google Analytics. That’s it. I have put the same tracking code on my blog and now I can track clicks on virtually any external link on my blog. The Pro and Enterprise version of Analytics Engine (which are off-course paid) provide additional features like form interactions, scroll tracking, cross domain tagging, custom rules etc. Its interface make event tracking pretty much effortless. So if you are heavily involved into Analytics consulting or are a big agency/company then you should consider investing in this tool.